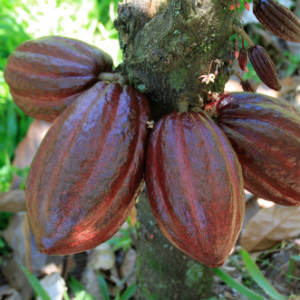 Many of our customers are surprised to learn that chocolate grows on trees. That is, cacao beans grow on trees before they’re fermented, dried, roasted, and ground to become the primary ingredient in chocolate as we know it. The beans grow inside brightly colored cacao pods that are filled with an edible creamy white and acidic pulp and anywhere from 20-70 seeds (cacao beans). Most cacao grows on trees about 20-30 feet tall nestled within rainforests within 22 degrees above or below the equator: anywhere from the Ivory Coast, Indonesia, Ghana, Nigeria, Cameroon, and Brazil. Smaller export countries include Ecuador, Honduras, Nicaragua, Colombia, Mexico, Belize, Venezuela, Peru, Bolivia, Dominican Republic, Papua New Guinea and many more places. The work conditions of the farm workers range from indentured servitude to fair treatment of workers with attention to economically sustainable trade practices. Maya visits cacao plantations and makes sure that every one of her chocolates reflects fair sustainable farming practices. Cacao beans vary distinctly depending on the cacao variety, growing conditions, terroir, and production methods. Comparison tasting is the best way to learn a particular chocolate’s flavor traits and develop your sensitivity to quality and subtle variations in character. Criollo: Grown largely in Central America, Criollo trees produce thin-shelled yellow or red pods that contain large round white or light purple beans. Considered the highest quality cacao bean, these beans have low astringency with complex mild, nutty, sweet flavor notes. 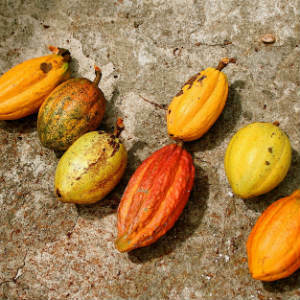 However, due to its low yield and susceptibility to disease, the Criollo is not widely cultivated. Forastero: About 80% of the world’s of cacao beans come from these highly-productive trees. Grown largely in South America and West Africa, the thick-shelled yellow pods contain flat purple beans. Forastero beans produce a strong cacao flavor with a bitter note. Trinitario: Grown in all cacao regions of the world, Trinitario originated in Trinidad as a hybrid of the Criollo and Forastero varieties. Trinitario combines the higher quality aromatic flavor of Criollo with the hardiness and productivity of Forastero. Tasters describe spicy, earthy, and fruity flavor notes. Nacional: Grown in Ecuador and Peru, this bean is believed to be a rare rediscovered member of the Forastero family thought to be extinct. Some pods produce unusual lower-acid white cacao beans that turn brown when roasted. The Nacional bean has a full cacao flavor with floral and spicy notes. 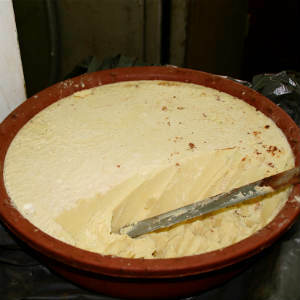 Cocoa butter (the fat contained in the cacao bean) is widely in cosmetics and pharmaceuticals—for example, to heal bruises. The beans also contain theobromine, an alkaloid used as a diuretic and to lower blood pressure. Antioxidant cocoa flavonoids are found in the dried beans may have anti-inflammatory properties as well as promote cardiovascular and immune health. Flavonoids reduce the bloods ability to clot, reducing the risk of heart attack and stroke. Cocoa butter in dark chocolate does not raise blood cholesterol, however some chocolates contain added fats or milk fat. Chocolate Maya selects chocolates that contain no added fats except the milk fat in milk chocolate. The carbohydrates in cacao beans come in the form of starch, soluble and insoluble dietary fiber and a small amount of simple sugar. Sugar is added in the manufacture of chocolate but the higher the percentage of cocoa, the less added sugar. The amount of caffeine in chocolate is far less than that found in a cup of coffee, tea, or colas. Phenylethylamine found in chocolate acts as a stimulant similar to the dopamine and adrenaline produced by the body. Seratonin in chocolate can increase seratonin in the brain. Seratonin levels are often lower in people experiencing depression or even just PMS. Cocoa beans contain essential minerals such as magnesium, calcium, iron, zinc, copper, potassium, and manganese. Vitamin content includes A, B1, B2, B3, C, E, and pantothenic acid.